The final day of the 2016 organ festival started with Parish Mass when the organ was played by John Neal for worship. The Parish Singers sang the Psalm and also an arrangement of 'A new Commandment' by David Barton which we bought recently after David gave away a free copy via Twitter. 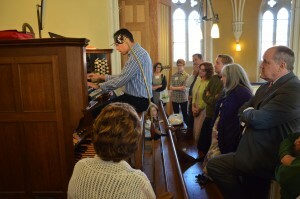 Jacob Collins accompanied us on the organ and provided the voluntary after the Mass. 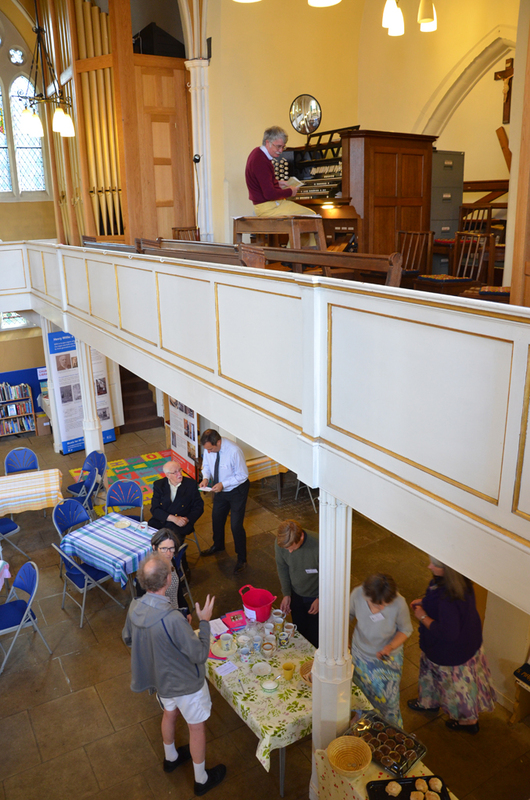 Jonathan Kingston arrived at 11:00 am as the congregation were enjoying tea and coffee so had a chance to chat before he gave an absorbing talk at the console about the Willis organ, the sounds it can produce and how the sound is built up by the organist. 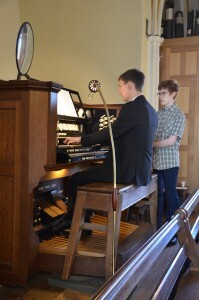 We learned all about keys, pistons, couplers, stops and pedals as he demonstrated the different sound combinations which are possible and explained about how organists learn to play with both hands and both feet doing different things! People peppered him with questions which he answered with clear explanations that both musical and non musical people could understand. Get to know our Willis! 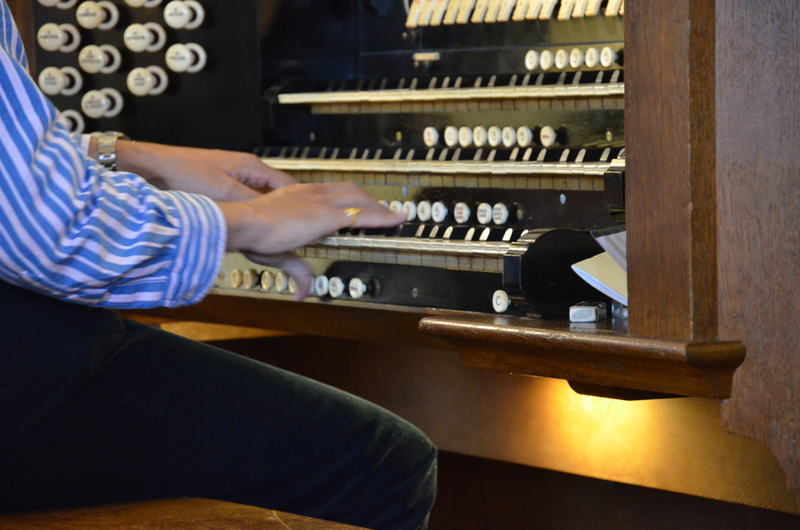 If only we could have bottled that hour of Jonathan imparting his knowledge in such an engaging way (it would have taken about 3 video cameras filming from different angles and mounted above people's heads and down by Jonathan's feet on the pedals as we clustered around the console). 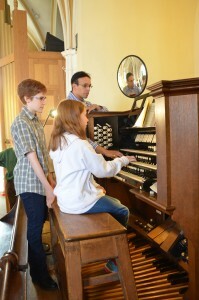 Then it was time for hands on the organ yourself. 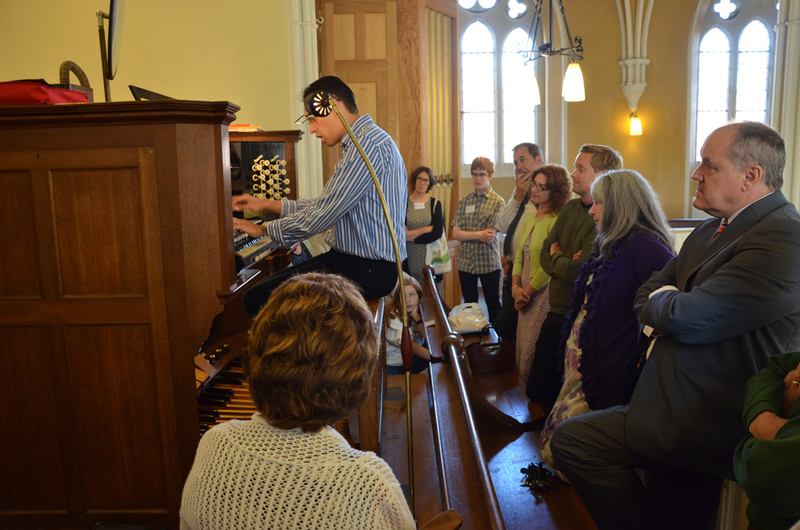 Jonathan guided younger players to a good combination of stops and suitable music, some others who arrived during the afternoon were experienced organists who wanted to try the Willis themselves and provided background music as people browsed the exhibition and enjoyed refreshments in the church. 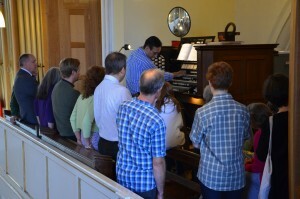 The street door was opened so that people could hear the organ from the High Street. 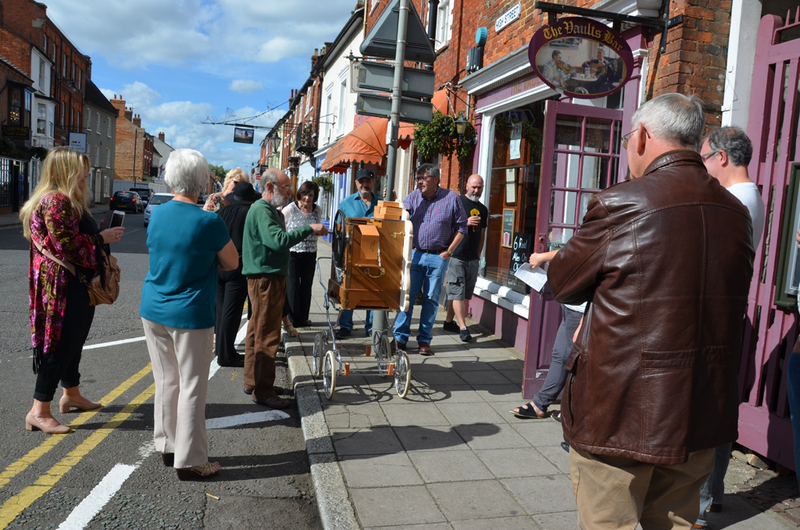 At one point the little hand-turned street organ was wheeled outside again to play and then paid a visit to the Vaults Bar where the Sunday afternoon folk group were meeting, they poured out onto the pavement and clustered around it to listen as John played Sailor's Hornpipe, Jenny Lind Polka and Teddy Bears' Picnic (to which they sang their own words), it then returned to the church so more visitors were able to look inside it. 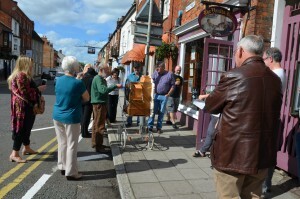 Soon after 3:00 pm Roger Sayer arrived for his 3:30 pm rehearsal. While we tidied away the tea tables Jonathan played the organ for Roger as he stood further down the nave to hear the different sounds. 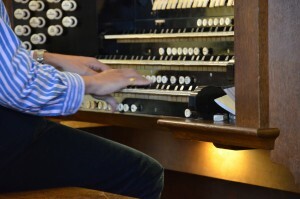 The console is not far enough in front of the pipes in the organ so it is hard for organists to truly know what it sounds like down the church. Having another experienced organist available to play for him to listen was very useful ahead of his rehearsal and evening recital. "Jonathan was so informative and interesting and I learnt a lot!" "Jonathan was easy to listen to and very concise in his explanations." "The introduction to the organ was fascinating, Jonathan made everything much clearer although the intricacies of the instrument seemed endless! 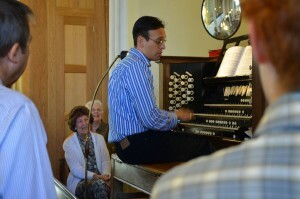 A truly informative and enjoyable talk." 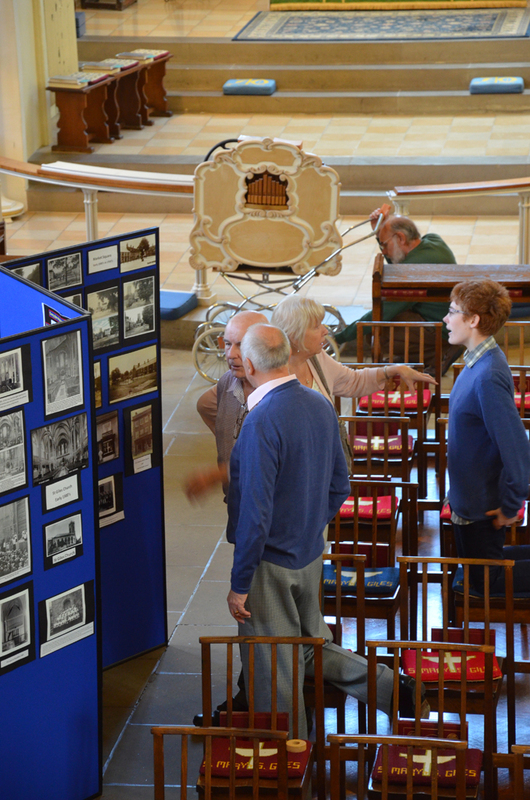 "Ellie was a mine of information about the organ and old photos of Stony Stratford." 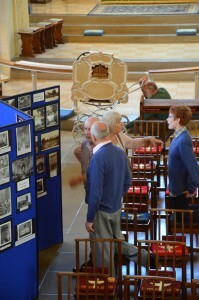 "The welcome, refreshments and programme booklet were good. Best wishes for more recitals." 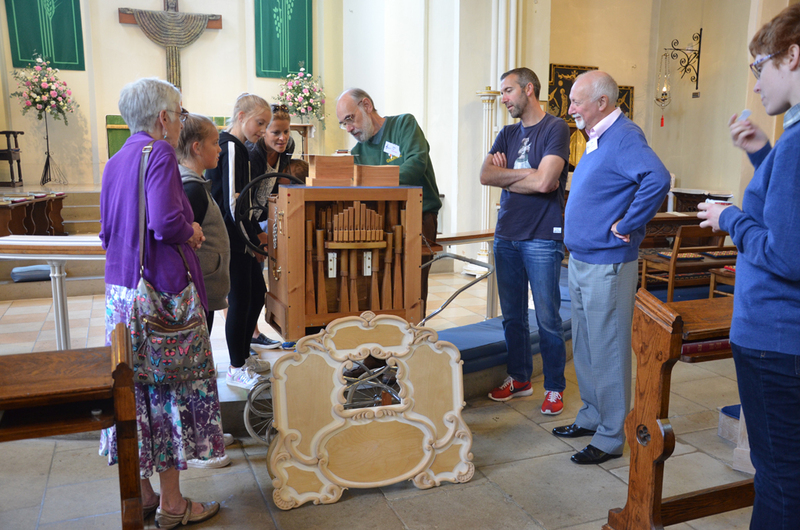 "I liked the lovely welcome and organ, of course." 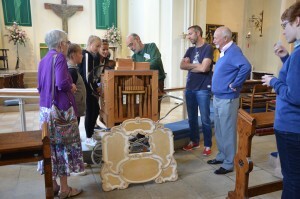 "I like most organ music, lovely sound"